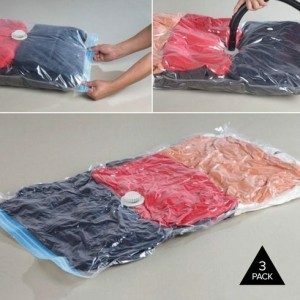 3 Pack X-Large Vacuum Storage Bags Only $5.99! You are here: Home / Great Deals / 3 Pack X-Large Vacuum Storage Bags Only $5.99! Everyone is Spring cleaning and that is the perfect time to grab some of these storage bags to use in tight spaces! 3 Pack X-Large Vacuum Storage Bags Only $5.99! These are also great for traveling. Perfect for helping you fit more in that tiny carry on so you don’t have to check bags when you fly! Grab this and other hot deals on Tanga every day!